Cursor Hider icon is in ReactOS system tray. Just tried to run Cursor Hider under ReactOS - CH starts, hides and show mouse pointer, but fails with call context menu and so on - Error windows are being shown till app is closed by OS. 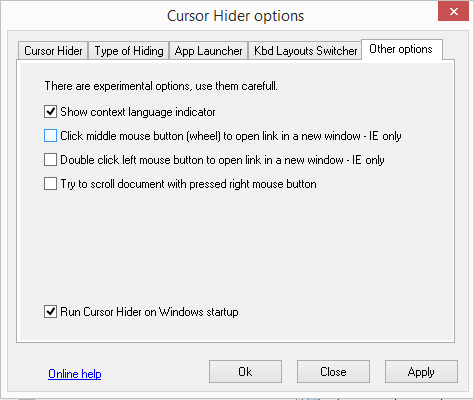 New feature is introduced into Cursor Hider. This is the Context language indicator. Now you always will know(and see) what is language active for keyboard input without any eyes moving to system language bar. - have a multimonitors configuration. To turn off (by default this feature is active) or turn on context language indicator go to software "Options..." than select "Other options" and mark or clear "Show context language indicator" checkbox. Context language indicator option is turn on.